Now that Halloween is out of the way, it is time to make some more soup for the freezer. This roasted pumpkin soup is glorious – smooth and delicious. The first thing you need to do is roast your pumpkin. Preheat your oven to gas mark 6, 200C. 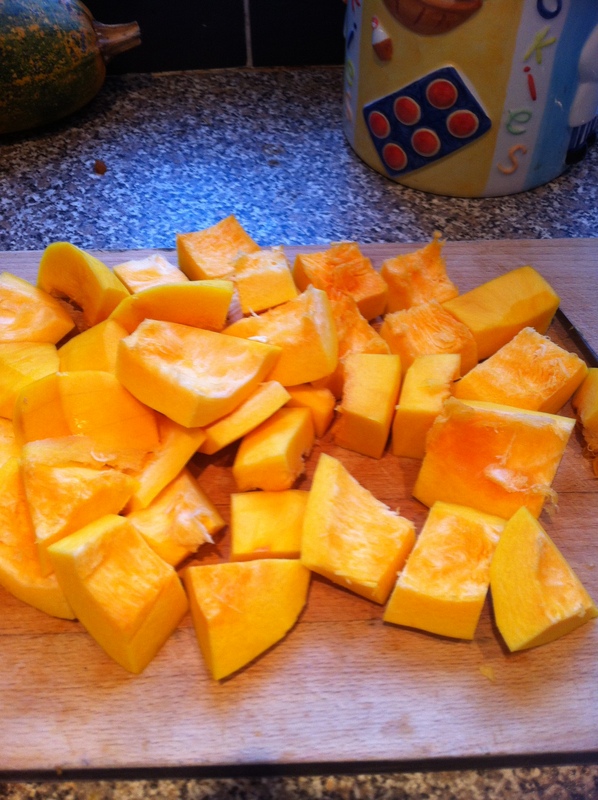 Peel your pumpkin and cut into large chunks – about 2 inch squares should do. Put into a bowl and mix in a couple of tablespoons of the oil. Roast in the hot oven until the pumpkin begins to soften – about 25 minutes. Meanwhile, peel and chop the onion and garlic and brown for 5 minutes in a small amount of oil, then add the cumin and cook for a further 2 or 3 minutes. Add the roasted pumpkin and the stock, and bring to the boil. Cover and simmer for about 15 minutes, seasoning to taste, then puree and cool. I save margarine, ice cream and large yogurt pots for my mega soup making sessions. I ladle single, double or larger portions, depending on the size of my container, label and freeze. Home-made soup is so much nicer than tinned, and a lot cheaper when you are using home grown veg as well as being a great way of using up a glut. We will be eating this delicious roasted pumpkin soup right through the winter. You can find more frugal recipe ideas here. looks delicious!!! will be trying this weekend for sure!